Before Wiscon I was waffling about whether or not I should take my new Regency garments. I really wanted to but I was also facing this thing in my brain which said that Serious Authors® don’t dress up as characters from their books. But the dress was so pretty! And there were parties! So I decided that since I’m also a fan, if I could find someone to wear the other dress then I’d feel comfortable dressing in period clothes for the parties. Mrs. Thomas kindly agreed to wear the blue dress and off we went. The photo is provided by Greer Gilman who took it while wearing her Tiptree tiara. As an aside, may I say that she looked absolutely fetching in the tiara. The blue dress is slightly later than the white one and still somewhat in progress. I found it on Etsy for $60 and my modiste is adding the detailing to make it appropriate for 1814, when Shades of Milk and Honey is set. The white dress is closer to an 1808 dress but is such a versatile style that adding accessories can push it earlier or later. For the launch party, I’ll add a spencer to it. Three discoveries from that evening. 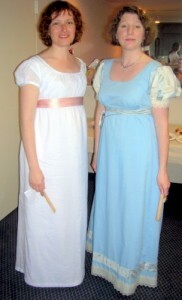 One: People loved the dresses and even the staff identified them as being from Jane Austen’s era. We became walking billboards for Shades of Milk and Honey. I handed out cards about the book, but next time I must carry a reticule with me. Two: When wearing the dresses our posture and bearing changed significantly from our daily wear. It felt wrong to slouch, for instance. I have on short stays which stop at the bottom of my ribs so I’m capable of slumping in my seat, but it didn’t feel right. Mrs. Thomas reports the same sensation even with modern undergarments. The cut of the dresses themselves leads one to want to sit up straight. It is also surprisingly comfortable. I had been told that when the short stays are correctly worn that they pull the shoulders back and down for the proper Regency silhouette. By the end of the evening, the only thing that was sore was, in fact, my shoulders, from being held so firmly in place. At the same time, I did not feel that my movement was particularly restricted. I’m sure I wouldn’t have been able to work a puppet, but nothing in he normal range of movements seemed restrictive. Three: We both carried fans which became natural extensions of our hands in conversation. Independently we both found ourselves gesturing with the fans and using the open and close of them as a form of expression. However, we were not versed in the language of the fan so one must hope that we did not send inadvertent signals. Actually, I think it’s more the distinction between someone who wants to be a writer and someone who is a writer. Since there’s already some serious Imposter Syndrome going on in my head, there’s a part of me that was afraid that if I wore the dress people would find out that I was faking it. All writers have imposter syndrome. Thinking you are an imposter is a sign that you are not one. (Now my brain is broken.) Love the dresses. Wish I could have been there. You know what else is really cool about this? I like the dressing up that does not involve overexposure, cleavage spilling out everywhere, bare midriff, plumber’s crack, or a major hair waxing project. Not every costume has to have dual use as a prostitution uniform. I feel *pretty* uncomfortable around some of the costumed ladies at conventions. If I may rant a bit, in medieval times, women wore quite a lot of clothing, in quite a lot of layers, and had their heads covered at all times (in styles that changed all the time, of course). Wouldn’t it be fun to see *that* at a convention, instead of Yon Anachronistic Bar Wench? Yes, the number of layers of is truly astonishing. This is wonderful! And you look very fetching and authentic. I’ve dressed in full-on 1881 (felt I needed to for research, which was my sneaky excuse for getting into a little re-enacting), and I loved it. I haven’t done it at a convention, though. You’re giving me courage to embrace the pleasures of a hall costume. I kinda hope I can dress steampunkish when I’m a guest at LosCon this year! 1881 has some loooovely clothes which are significantly more restrictive than my era. At some point, if we ever have a chance, I’ll have to show you my dress from the 1860s. I collect vintage clothing and got very lucky one day. I have tops from the 1880s but never found a full dress that would fit me. Not surprising but my rule is that I have to be able to wear it or I’d own too many nice things. The only time I wore Regency dress at a convention (I think) I was required to swoon. Emma will likely remember it. I had made strategic applications of spirit gum beforehand, because the dress was really, really low cut, and swooning posed all sorts of hazards, even with stays. To the disappointment of some onlookers, I did not become a Regency Janet Jackson. You looked utterly gorgeous in the dress, by the way. Just sayin’. I’ll bet you are a fabulous swooner. That’s very interesting about the posture! I used to have a modern dress cut in a Regency silhouette and I noticed the same thing about it. Obviously we need more such dresses. Told ya. 😀 Glad you had fun doing it! That dress is just gorgeous in its simplicity.